What could be more natural for a blue cottage bath than the color of water? 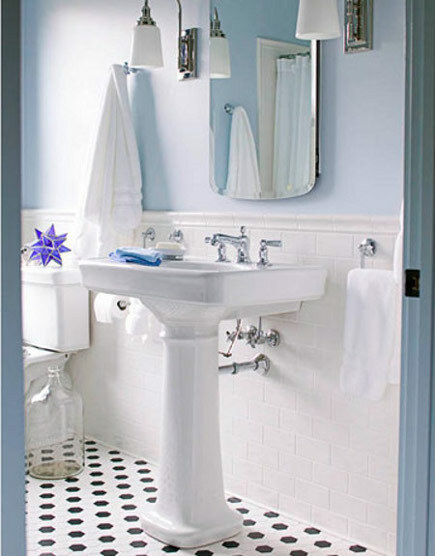 Thoughts of a light, bright and soothing paint colors for a blue cottage bath reminded me of two that work well with white tile and beadboard. Both are bathroom blues I have long admired – Farrow & Ball’s Borrowed Light and Sherwin Williams’ Hinting Blue. Borrowed Light is pale but intense and much like the color of the sky or the Pacific ocean as it does lean towards green-blue as opposed to red-blue. Boston designer Frank Roop used it effortlessly in the charming master [top] with white beadboard, antique-style clawfoot tub plus a dazzling glass-tile floor installed like a carpet. Windows high up on three sides of the small space give it an especially etheral quality. A magazine editor wrote about building his dream house in upstate New York and showed off his blue cottage bath, which is a cottage-deco mix. It boasts popular fixtures like the Pottery Barn Somerson sconces and a Kohler pedestal sink with a lever-handle faucet. White subway tile wainscoting and 2-inch black and white hex tile floor put out the mixed vibe. Still, it was the color – Sherwin Williams’ Hinting Blue – that offers a similar sense of calm and luxury that every good bathroom should own.